We can all agree that a bedroom should serve as a sanctuary, a place where we can relax and feel renewed after a long day. The surroundings should be soft, warm, and personal — feeling more like "you" than any other area in your home. But how do you juggle comfort, style, and personality in one cohesive space? Thanks to fresh palettes, plush materials, and sleek lighting, the task of transforming your bedroom into an au courant, yet comfortable, oasis just got a little easier. Here are seven ways to help you perfect the modern chic look in your own sleeping quarters. 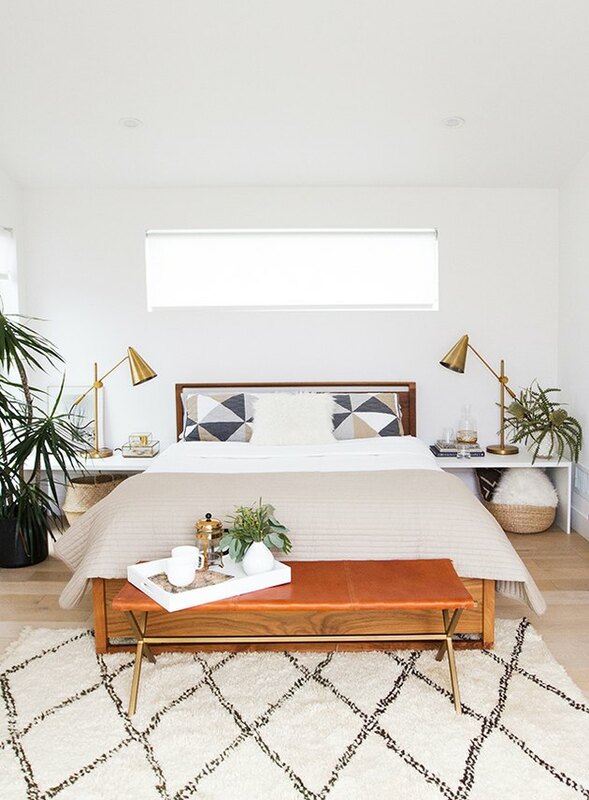 In this lake house bedroom crafted by Shea from Studio McGee, modern styling is communicated with clean lines. The channel tufted headboard, throw pillows, furniture, and even decorative items work well together to create a balanced and tranquil vibe. 2. A carefully curated color palette is key. Modern chic bedrooms always seem to have a flawless color palette, one that displays shades that are personal to the homeowner. 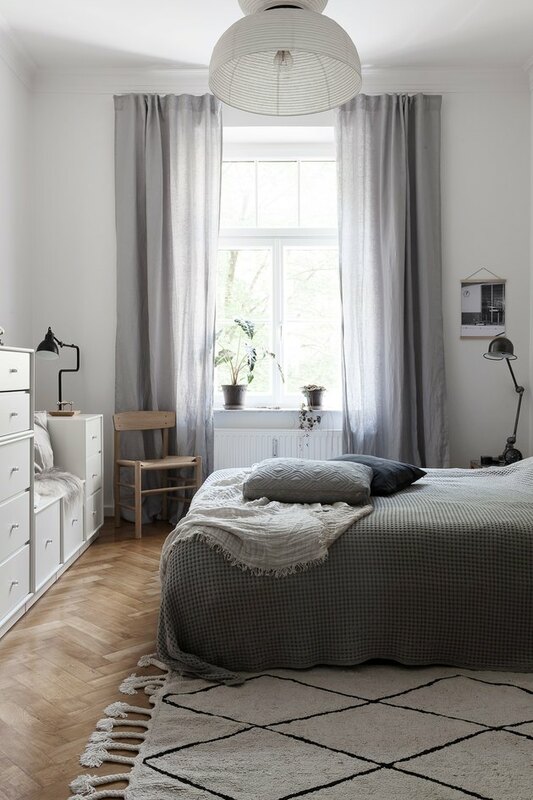 In her bedroom, Sarah of Coco Lapine Design chose bedding and drapery in dreamy shades of gray, which pair beautifully with the white and black contrasting accents throughout. 3. Weave in on-trend textures and materials. 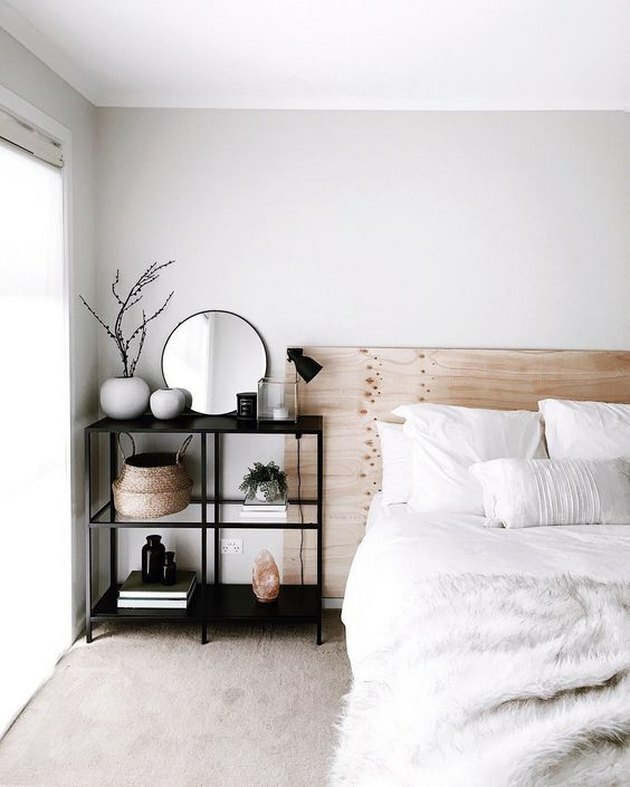 A multitude of textures and materials are showcased in this modern chic bedroom belonging to Jess from Positively Oakes. 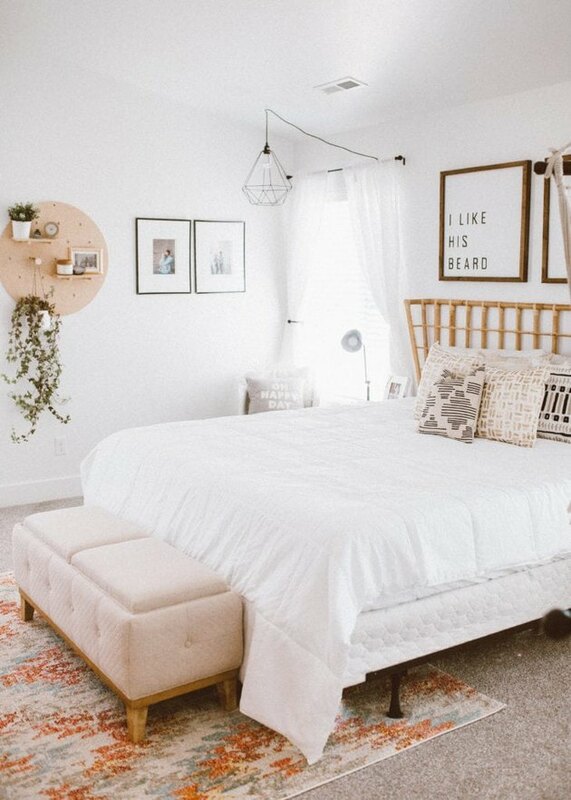 From the rattan headboard to the cage pendant light to the round pegboard, there is more than enough eye candy to go around. 4. Take risks with patterns. Whether bold or subtle, you can transform your bedroom by mixing in a few key patterns from similar color families. The vibrant drapery in this guest bedroom designed by Victoria Smith from SF Girl by Bay looks striking alongside the woven quilt and matching tufted pillow shams. Look to your travels, or places you wish to travel, for inspiration when designing your modern chic bedroom. In this space designed by Sarah Sherman Samuel, geometric patterns, tropical foliage, and woven baskets infuse gorgeous global style. 6. Minimal, and yet, has impact. Minimalism is a trend that's still going strong, and one of the best places to embrace this design style is in the bedroom. 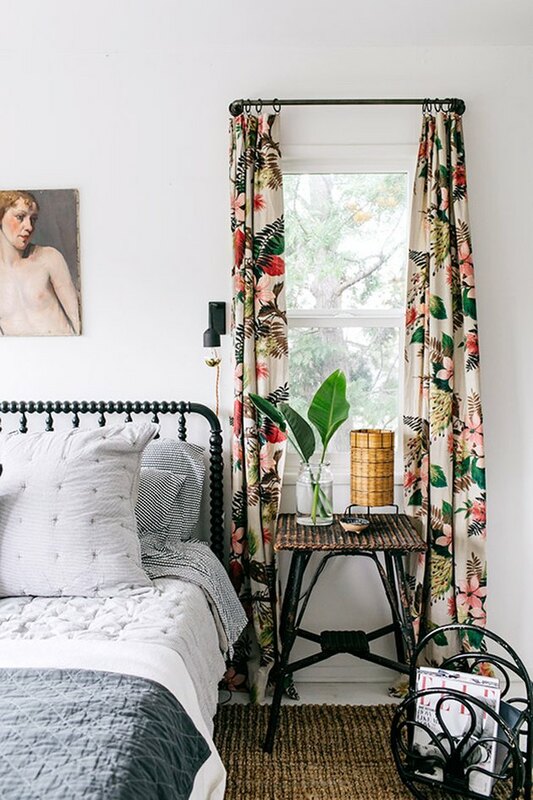 Australian-based blogger Jem from Juthamat by Jem has mastered the pared-down look, and we couldn't help but stop and stare at her stunning black-and-white boudoir. We live in a time when people increasingly prefer unfussy spaces, and a bedroom naturally lends itself to soothing, simple hues. A picture-perfect example is this space designed by Timothy Godbold that encapsulates the trend beautifully, thanks to neutral throw pillows, a light wood four-poster bed, and soft beige walls.